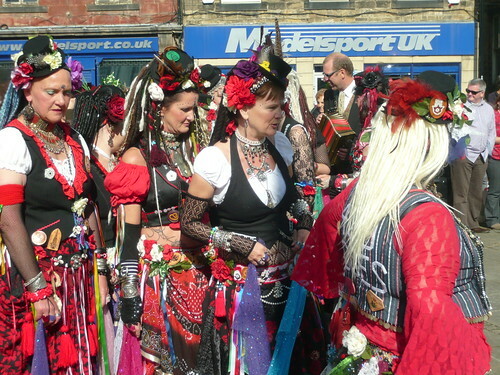 Folk festivals bring out a growing diversity of dancing teams and styles and none are more exotic than the Four Hundred Roses. 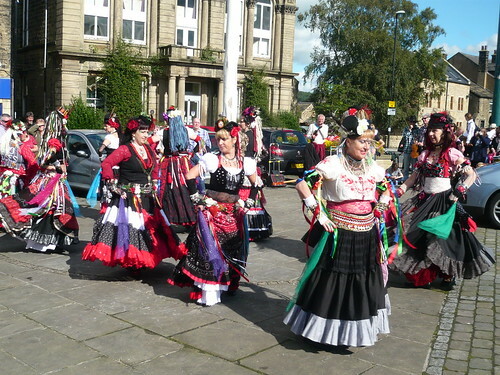 ‘Four Hundred Roses’ is a group of belly dancers from Leeds, Bradford, Keighley, their current base. They have been around for 7 years and it probably took that long to make all the dresses and collect 400 roses. Their form of folk dancing combines UK folk music and dance with Tribal style bellydance. This creates a feel of an ethnic dance form without belonging to any real-world ethnic grouping. The unique UK Tribal music is created in Hebden Bridge renown for its arts and music. Stephen Wood (aka “Woody”) creates a fusion of Arabic rhythms and traditional UK instruments and tunes. There may be some assistance from the latest computer technology and musicians on the street during outdoor performances. Four Hundred Roses were lucky to be granted funding by the Arts Council and are now bringing a touch of the exotic dancing to Yorkshire. This Folk Dancing with an Exotic Touch has some origins in the USA but it is not hard to see the Armenian or Arabic influences nor those of Yorkshires own Morris dancing. If you are quick you may catch them at the Masham sheep fair or Sowerby Rushbearing. We saw them perform at the 21st Otley folk festival which accounts for the Maypole growing out of one of the dancers heads in the photograph above. Should you wish to join in or find out more look on the 400 roses web site. Rather confusingly I have found a second web site for 400 roses so may be their are 400 red and 400 white roses of our county and that other one over the hills.